Clad in plate armor that gleams in the sunlight despite the dust and grime of long travel, a human lays down her sword and shield and places her hands on a mortally wounded man. Divine radiance shines from her hands, the man’s wounds knit closed, and his eyes open wide with amazement. A dwarf crouches behind an outcrop, his black cloak making him nearly invisible in the night, and watches an orc war band celebrating its recent victory. Silently, he stalks into their midst and whispers an oath, and two orcs are dead before they even realize he is there. Silver hair shining in a shaft of light that seems to illuminate only him, an elf laughs with exultation. His spear flashes like his eyes as he jabs again and again at a twisted giant, until at last his light overcomes its hideous darkness. Whatever their origin and their mission, paladins are united by their oaths to stand against the forces of evil. Whether sworn before a god’s altar and the witness of a priest, in a sacred glade before nature spirits and fey beings, or in a moment of desperation and grief with the dead as the only witness, a paladin’s oath is a powerful bond. It is a source of power that turns a devout warrior into a blessed champion. A paladin swears to uphold justice and righteousness, to stand with the good things of the world against the encroaching darkness, and to hunt the forces of evil wherever they lurk. Different paladins focus on various aspects of the cause of righteousness, but all are bound by the oaths that grant them power to do their sacred work. Although many paladins are devoted to gods of good, a paladin’s power comes as much from a commitment to justice itself as it does from a god. Paladins train for years to learn the skills of combat, mastering a variety of weapons and armor. Even so, their martial skills are secondary to the magical power they wield: power to heal the sick and injured, to smite the wicked and the undead, and to protect the innocent and those who join them in the fight for justice. Almost by definition, the life of a paladin is an adventuring life. Unless a lasting injury has taken him or her away from adventuring for a time, every paladin lives on the front lines of the cosmic struggle against evil. Fighters are rare enough among the ranks of the militias and armies of the world, but even fewer people can claim the true calling of a paladin. When they do receive the call, these warriors turn from their former occupations and take up arms to fight evil. Sometimes their oaths lead them into the service of the crown as leaders of elite groups of knights, but even then their loyalty is first to the cause of righteousness, not to crown and country. Adventuring paladins take their work seriously. A delve into an ancient ruin or dusty crypt can be a quest driven by a higher purpose than the acquisition of treasure. Evil lurks in dungeons and primeval forests, and even the smallest victory against it can tilt the cosmic balance away from oblivion. The most important aspect of a paladin character is the nature of his or her holy quest. Although the class features related to your oath don’t appear until you reach 3rd level, plan ahead for that choice by reading the oath descriptions at the end of the class. Are you a devoted servant of good, loyal to the gods of justice and honor, a holy knight in shining armor venturing forth to smite evil? Are you a glorious champion of the light, cherishing everything beautiful that stands against the shadow, a knight whose oath descends from traditions older than many of the gods? Or are you an embittered loner sworn to take vengeance on those who have done great evil, sent as an angel of death by the gods or driven by your need for revenge? The Gods of the Multiverse section lists many deities worshiped by paladins throughout the multiverse, such as Torm, Tyr, Heironeous, Paladine, Kiri-Jolith, Dol Arrah, the Silver Flame, Bahamut, Athena, Re-Horakhty, and Heimdall. How did you experience your call to serve as a paladin? Did you hear a whisper from an unseen god or angel while you were at prayer? Did another paladin sense the potential within you and decide to train you as a squire? Or did some terrible event—the destruction of your home, perhaps—drive you to your quests? Perhaps you stumbled into a sacred grove or a hidden elven enclave and found yourself called to protect all such refuges of goodness and beauty. Or you might have known from your earliest memories that the paladin’s life was your calling, almost as if you had been sent into the world with that purpose stamped on your soul. As guardians against the forces of wickedness, paladins are rarely of any evil alignment. Most of them walk the paths of charity and justice. Consider how your alignment colors the way you pursue your holy quest and the manner in which you conduct yourself before gods and mortals. Your oath and alignment might be in harmony, or your oath might represent standards of behavior that you have not yet attained. You can make a paladin quickly by following these suggestions. First, Strength should be your highest ability score, followed by Charisma. Second, choose the noble background. A paladin tries to hold to the highest standards of conduct, but even the most virtuous paladin is fallible. Sometimes the right path proves too demanding, sometimes a situation calls for the lesser of two evils, and sometimes the heat of emotion causes a paladin to transgress his or her oath. A paladin who has broken a vow typically seeks absolution from a cleric who shares his or her faith or from another paladin of the same order. 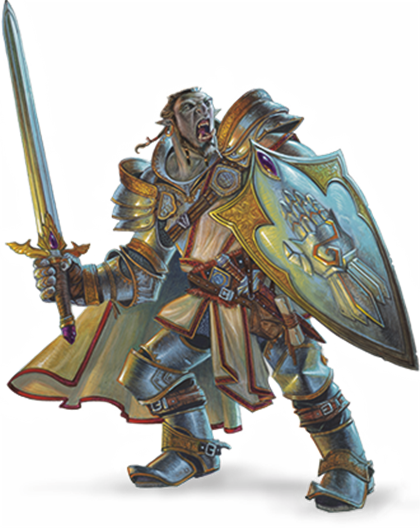 The paladin might spend an all-night vigil in prayer as a sign of penitence, or undertake a fast or similar act of self-denial. After a rite of confession and forgiveness, the paladin starts fresh. As a paladin, you gain the following class features. The presence of strong evil registers on your senses like a noxious odor, and powerful good rings like heavenly music in your ears. As an action, you can open your awareness to detect such forces. Until the end of your next turn, you know the location of any celestial, fiend, or undead within 60 feet of you that is not behind total cover. You know the type (celestial, fiend, or undead) of any being whose presence you sense, but not its identity (the vampire Count Strahd von Zarovich, for instance). Within the same radius, you also detect the presence of any place or object that has been consecrated or desecrated, as with the hallow spell. You can use this feature a number of times equal to 1 + your Charisma modifier. When you finish a long rest, you regain all expended uses. Your blessed touch can heal wounds. You have a pool of healing power that replenishes when you take a long rest. With that pool, you can restore a total number of hit points equal to your paladin level × 5. As an action, you can touch a creature and draw power from the pool to restore a number of hit points to that creature, up to the maximum amount remaining in your pool. Alternatively, you can expend 5 hit points from your pool of healing to cure the target of one disease or neutralize one poison affecting it. You can cure multiple diseases and neutralize multiple poisons with a single use of Lay on Hands, expending hit points separately for each one. This feature has no effect on undead and constructs. At 2nd level, you adopt a style of fighting as your specialty. Choose one of the following options. You can’t take a Fighting Style option more than once, even if you later get to choose again. While you are wearing armor, you gain a +1 bonus to AC. When you are wielding a melee weapon in one hand and no other weapons, you gain a +2 bonus to damage rolls with that weapon. When you roll a 1 or 2 on a damage die for an attack you make with a melee weapon that you are wielding with two hands, you can reroll the die and must use the new roll. The weapon must have the two-handed or versatile property for you to gain this benefit. When a creature you can see attacks a target other than you that is within 5 feet of you, you can use your reaction to impose disadvantage on the attack roll. You must be wielding a shield. By 2nd level, you have learned to draw on divine magic through meditation and prayer to cast spells as a cleric does. See Spells Rules for the general rules of spellcasting and the Spells Listing for the paladin spell list. The Paladin table shows how many spell slots you have to cast your paladin spells. To cast one of your paladin spells of 1st level or higher, you must expend a slot of the spell’s level or higher. You regain all expended spell slots when you finish a long rest. You prepare the list of paladin spells that are available for you to cast, choosing from the paladin spell list. When you do so, choose a number of paladin spells equal to your Charisma modifier + half your paladin level, rounded down (minimum of one spell). The spells must be of a level for which you have spell slots. For example, if you are a 5th-level paladin, you have four 1st-level and two 2nd-level spell slots. With a Charisma of 14, your list of prepared spells can include four spells of 1st or 2nd level, in any combination. If you prepare the 1st-level spell cure wounds, you can cast it using a 1st-level or a 2nd-level slot. Casting the spell doesn’t remove it from your list of prepared spells. You can change your list of prepared spells when you finish a long rest. Preparing a new list of paladin spells requires time spent in prayer and meditation: at least 1 minute per spell level for each spell on your list. Charisma is your spellcasting ability for your paladin spells, since their power derives from the strength of your convictions. You use your Charisma whenever a spell refers to your spellcasting ability. In addition, you use your Charisma modifier when setting the saving throw DC for a paladin spell you cast and when making an attack roll with one. You can use a holy symbol (see the Adventuring Gear section) as a spellcasting focus for your paladin spells. Starting at 2nd level, when you hit a creature with a melee weapon attack, you can expend one spell slot to deal radiant damage to the target, in addition to the weapon’s damage. The extra damage is 2d8 for a 1st-level spell slot, plus 1d8 for each spell level higher than 1st, to a maximum of 5d8. The damage increases by 1d8 if the target is an undead or a fiend, to a maximum of 6d8. By 3rd level, the divine magic flowing through you makes you immune to disease. When you reach 3rd level, you swear the oath that binds you as a paladin forever. Up to this time you have been in a preparatory stage, committed to the path but not yet sworn to it. Now you choose the Oath of Devotion detailed at the end of the class description or one from another source. Your choice grants you features at 3rd level and again at 7th, 15th, and 20th level. Those features include oath spells and the Channel Divinity feature. Each oath has a list of associated spells. You gain access to these spells at the levels specified in the oath description. Once you gain access to an oath spell, you always have it prepared. Oath spells don’t count against the number of spells you can prepare each day. If you gain an oath spell that doesn’t appear on the paladin spell list, the spell is nonetheless a paladin spell for you. Your oath allows you to channel divine energy to fuel magical effects. Each Channel Divinity option provided by your oath explains how to use it. When you use your Channel Divinity, you choose which option to use. You must then finish a short or long rest to use your Channel Divinity again. Some Channel Divinity effects require saving throws. When you use such an effect from this class, the DC equals your paladin spell save DC. Starting at 6th level, whenever you or a friendly creature within 10 feet of you must make a saving throw, the creature gains a bonus to the saving throw equal to your Charisma modifier (with a minimum bonus of +1). You must be conscious to grant this bonus. Starting at 10th level, you and friendly creatures within 10 feet of you can’t be frightened while you are conscious. By 11th level, you are so suffused with righteous might that all your melee weapon strikes carry divine power with them. Whenever you hit a creature with a melee weapon, the creature takes an extra 1d8 radiant damage. Beginning at 14th level, you can use your action to end one spell on yourself or on one willing creature that you touch. You can use this feature a number of times equal to your Charisma modifier (a minimum of once). You regain expended uses when you finish a long rest. At 18th level, the range of your auras increase to 30 feet. Becoming a paladin involves taking vows that commit the paladin to the cause of righteousness, an active path of fighting wickedness. The final oath, taken when he or she reaches 3rd level, is the culmination of all the paladin’s training. Some characters with this class don’t consider themselves true paladins until they have reached 3rd level and made this oath. For others, the actual swearing of the oath is a formality, an official stamp on what has always been true in the paladin’s heart. The Oath of Devotion binds a paladin to the loftiest ideals of justice, virtue, and order. Sometimes called cavaliers, white knights, or holy warriors, these paladins meet the ideal of the knight in shining armor, acting with honor in pursuit of justice and the greater good. They hold themselves to the highest standards of conduct, and some, for better or worse, hold the rest of the world to the same standards. Many who swear this oath are devoted to gods of law and good and use their gods’ tenets as the measure of their devotion. They hold angels—the perfect servants of good—as their ideals, and incorporate images of angelic wings into their helmets or coats of arms. Though the exact words and strictures of the Oath of Devotion vary, paladins of this oath share these tenets. Honesty. Don’t lie or cheat. Let your word be your promise. Courage. Never fear to act, though caution is wise. Compassion. Aid others, protect the weak, and punish those who threaten them. Show mercy to your foes, but temper it with wisdom. Honor. Treat others with fairness, and let your honorable deeds be an example to them. Do as much good as possible while causing the least amount of harm. Duty. Be responsible for your actions and their consequences, protect those entrusted to your care, and obey those who have just authority over you. Sacred Weapon. As an action, you can imbue one weapon that you are holding with positive energy, using your Channel Divinity. For 1 minute, you add your Charisma modifier to attack rolls made with that weapon (with a minimum bonus of +1). The weapon also emits bright light in a 20-foot radius and dim light 20 feet beyond that. If the weapon is not already magical, it becomes magical for the duration. You can end this effect on your turn as part of any other action. If you are no longer holding or carrying this weapon, or if you fall unconscious, this effect ends. Turn the Unholy. As an action, you present your holy symbol and speak a prayer censuring fiends and undead, using your Channel Divinity. Each fiend or undead that can see or hear you within 30 feet of you must make a Wisdom saving throw. If the creature fails its saving throw, it is turned for 1 minute or until it takes damage. You gain oath spells at the paladin levels listed. Starting at 7th level, you and friendly creatures within 10 feet of you can’t be charmed while you are conscious. Beginning at 15th level, you are always under the effects of a protection from evil and good spell. At 20th level, as an action, you can emanate an aura of sunlight. For 1 minute, bright light shines from you in a 30-foot radius, and dim light shines 30 feet beyond that. Whenever an enemy creature starts its turn in the bright light, the creature takes 10 radiant damage. In addition, for the duration, you have advantage on saving throws against spells cast by fiends or undead. Where can I find the other oaths? You can find the other oaths in the Player's Handbook and Xanathar's Guide to Everything. You can find other oaths for an online build in the marketplace. I believe they charge 1.99 per extra oath. Wish there was at least a list of Oaths (and other subclasses) with what book they are in. New to 5e, do paladins no longer have the turn undead ability? It's included in the Paladin Class, Sacred Oaths now. Oath of Devotion/Channel Divinity allows "Turn the Unholy"; that targets fiends and undead. Oath of the Ancients/Channel Divinity allows "Turn the Faithless" that targets fey and fiends. when i make a level 7 oath of the ancients paladin the character sheet says they get all languages is that a glitch or am i missing something? I get the same thing happening. Given the ability is only "Resistance vs spells" I believe this is an error in how the sub-class was created. There should be no bonus languages. I get the exact same thing, and there's nothing in the book that says they get all languages.